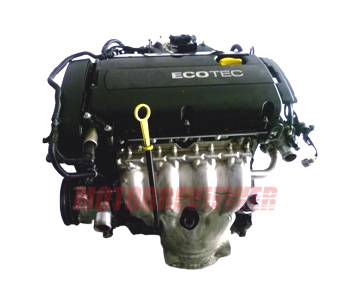 The 1.6-liter Chevrolet engine named as the F16D4 engine is the result of the F16D3 evolution. This new engine was equipped with the variable valve timing system (VVT) and system what changes intake and exhaust channel lengths (variable intake manifold). Finally, the problem with valves was solved. The Exhaust Gas Recirculation system (EGR) was also removed. These are big changes. As a result, we got more powerful and reliable engine. Like the previous version, the engine has cast iron cylinder block with steel crankshaft and forged steel conrods, 16 valves and two overhead camshafts (DOHC) aluminum head on top of the engine block, multi-point electronic fuel injection and ignition system, timing belt (not a chain). By the way, this engine is almost a copy of the A16XER produced by Opel. 1. If you don't look at the timing belt condition, in one day an engine disaster will happen - bent valves, crushed pistons, etc. 2. The thermostat is the weakest point of GM engines, and the F16D4 is not an exception. 3. Oil leaks from head cover, like on previous model the F16D3. 4. This engine doesn't have hydraulic tappets anymore. You need to adjust the valve gaps by yourself every 60,000 miles. But somebody thinks that's an advantage of this engine.